We recently had spring break for the kiddos. We decided to take a trip down to Moab. I have lived in Utah my entire life and never been there. And I have been missing out! We rented a jeep to take down there for Jeep Weekend. Now, I am getting pretty big and pregnant. I am nearing the end! We tried to keep the trails easy for me. But the hubby would always underestimate the length of things just so I would go! The hike was a whole lot longer than 1/4 mile, and the trails that we took were a little bumpy. It may have caused a few contractions and my feet may have tripled in size. But all in all we had a blast! A fun little getaway right before the babe gets here. I love meals that I make that immediately go into my top 10 favorites of all time. This was one of those meals. It was SO easy to put together. And the flavor was absolutely fantastic. It was perfectly tender and moist and the french fried onions gave it a delicious crunch on the outside. And did I mention how fantastic the flavor was? Oh yes I did. We couldn’t get enough of it and the family was raving how amazing it was! You are going to love this one too! 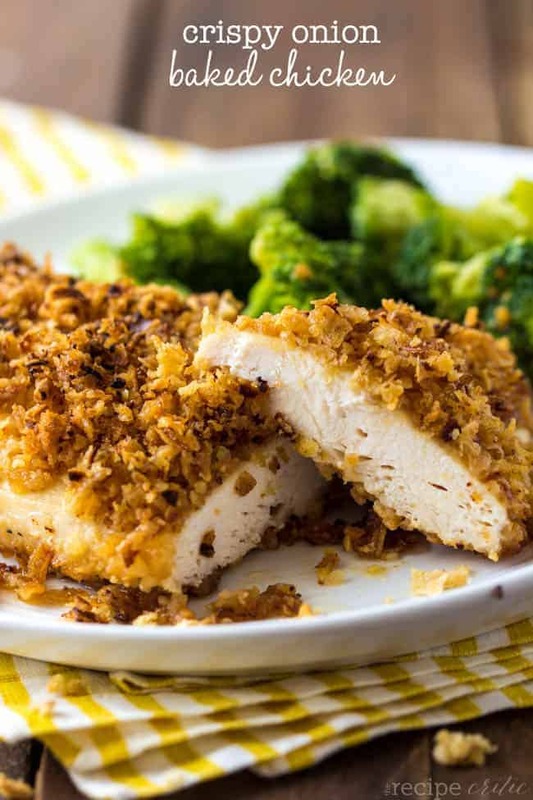 An easy and delicious chicken that is baked with crispy onions and has a fantastic flavor! Preheat oven to 350 degrees. Grease a 9 inch square pan and set aside. In a shallow bowl combine, melted butter, Worcestershire sauce, ground mustard, garlic salt, and pepper. Place ½ cup crushed fried onions in another shallow bowl. Dredge each chicken breast in the butter mixture and then coat with the onions. Place each chicken breast in the 9 inch pan. Sprinkle remaining crushed onions on the top and drizzle the remaining butter sauce on the top of chicken. Bake for about 30 minutes until no longer pink and cooked throughout. I made this recipe for dinner tonight and it was very yummy. My chicken was kind of big and thick so I had to use a 9×13 and bake for 40 minutes.